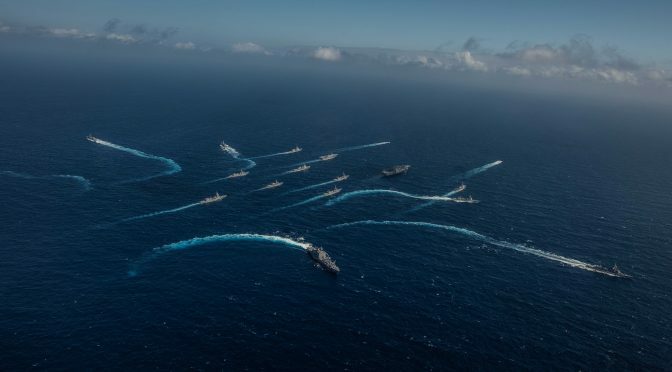 The US Navy concept for Distributed Maritime Operations (DMO) involves an issue no one seems to want to discuss: the capability of a near peer nation to exploit the RF emissions of DMO Surface Action Groups to attack first and with maximum effect. While the term “near peer” is generally associated with forces and weapons, it applies as well to a nation having satellite, airborne, maritime, and land-based surveillance, reconnaissance, and intelligence that approaches or equals that of the US. For operations in AA/AD waters off the coast of an adversary, the proximity to land-based maritime ISR capabilities such as aircraft and over-the-horizon radar gives the adversary an additional advantage. The emerging DMO concept describes a force that operates without RF restriction, using two-way satellite communications, data links, and line-of-sight communications as well as radars. This suggests the US Navy is assuming the US maritime surveillance capabilities are stunningly superior; and, believing that the fully networked DMO force is so capable that any attacking force would be detected first, attacked first, and decimated. The central question is what are the projected near peer’s surveillance, reconnaissance and target acquisition capabilities when presented with the RF signatures offered by the distributed force. If the near peer exploits RF emissions to detect, locate, identify/classify and target DMO units they likely will be targeted and attacked first and decisively. The authors would do well to remember that the enemy gets a vote. If I were to play adversary, I would absolutely never fight the way the Navy expects – the way they’ve planned and rehearsed to defeat me. Even if my capabilities were superior, I would attack in asymmetric ways. Why? Far more bang for my buck. And a chance I’ll survive to fight another day. I would not send a single lone submarine and wait patiently for its isolated detection and defeat before launching my next attack. Maybe I’d send a wave of plastic debris…which just so happens to adhere to hulls and provide lock-on for kinetic attack. Or maybe a fleet of seabirds…which are actually suicide-bombing UAVs – or nodes for my mesh network. Or perhaps I’d start spoofing tracks, tricking “Blue” not just into wasting ammunition but into launching strategically devastating and operationally flustering first strikes. When Blue goes EMCON, I’ll just pull up my open-source global satellite imagery and find them all anyway. Hard to hide an aircraft carrier these days. Especially when 4,000 land-starved sailors book up every available hotel room in advance of a “classified” port call. We can build ever-fancier systems ad nauseam. But where is the cost-benefit analysis against a real enemy, with the enemy’s inherent unpredictability? Admiral Richardson’s call to inspire new thinking in the face of constrained budgets is not necessarily a blueprint for fancy networked architecture. I fear a decade of technological investment has left the Navy no less ready for a zero-day, analog, asymmetric Millennial Challenge salvo – leaving the same risk that its entire fleet will be on the bottom of the ocean before the war even “starts.” In real life, you can’t refloat everyone overnight and reboot the game. PS. T-AOs (oilers) and T-AKEs (ammo/supply ships) routinely deploy with CSGs at present. There is also a reserve community in the Navy, SSOs, many of whom concurrently sail with MSC, whose sole purpose is to provide surge manning to cover for any civilians who decline to work in war zones. It is clear that the EM domain is both the key capability AND the key vulnerability of DMO. R&D has to be devoted to coming up with game changing alternate means of data communication that are NOT RF based. Sounds impossible … maybe. We know that considerable research has been ongoing with respect to undersea comms, related to command and control of USVs. In Capt. David Poyer’s war with China series of novels, he postulated that the Chinese lofted a huge constellation of high flying, “gossamer albatross” like drones that presented a very tiny RCS yet were able to communicate effectively with Chinese forces to provide early warning of American and allied naval forces. Perhaps there was some simple “science fiction” going on in Capt. Poyer’s imagination, but that is similar to what Heather B is suggesting above in her comment. Unless we can figure out how to communicate hard data in an EM denied environment, the networking simply won’t work, or at least reliably enough to make the rest of DMO work. And of course if our naval planners have already figured out that solution, it will be among the most highly protected secrets our military has!